Back in the early 70s, I worked at McClelland & Stewart Limited. It was a glorious time at M & S. Jack McClelland was at the helm. He could boast a list of iconic authors: Alice Munro. Margaret Laurence. Robertson Davies. W. O. Mitchell. Pierre Berton. Mordecai Richler. Margaret Atwood. And many, many other great Canadian writers called M & S their publishing home. 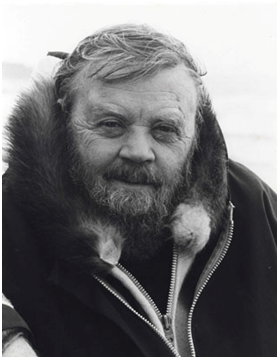 And that included Farley Mowat, a supreme storyteller and author of more than 40 books in his lifetime including People of the Deer; The Boat Who Wouldn’t Float; The Dog that Wouldn’t Be, And No Birds Sang, Lost in the Barrens and Never Cry Wolf. I started out picking and packing books in the warehouse of M & S and worked my way up to Author Royalty and Copyright Clerk in the VP’s office. It was not unusual to see authors travelling the halls and meeting with editorial staff. Once, I nearly spilled a cup of coffee on Pierre Berton. He was in his usual off-white summer suit and strode into the hall just as I turned the corner. I had split second of decision. I wore the coffee instead. But that, as they say, is another story. Farley Mowat twice attended the annual Christmas party while I worked there. He’d regale listeners with tales, pipe in hand and all decked out in his (in)famous kilt. And yes, once, someone dared to ask him what he wore beneath and, typical Farley Mowat, he obliged and pulled a Braveheart right in centre of the large banquet room of Fantasy Farms nestled in the hills of the Don Valley in Toronto. But Farley showed a side of him that was much more than that irreverent, funny, opinionated and passionate man. 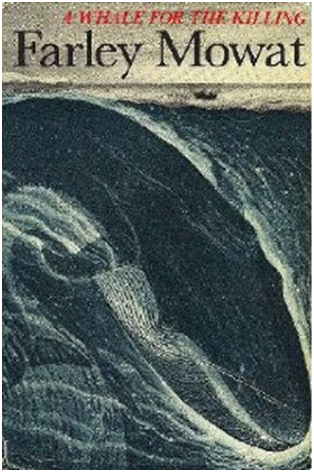 In the fall of 1972, his book A Whale for the Killing was a bit late in the process of publishing. To make sure it got to the stores in time for Christmas sales, many people at M & S put in extra effort. For authors, (and publishers) pre-holiday sales can make a huge difference in sales. A few days before the M & S Christmas party, there was a snowstorm and by mid-afternoon, they were pulling the buses off the side roads. It was typical Toronto in a snowstorm: THE STORM OF THE DECADE had befallen us. Well, it really was nasty. The warehouse and front office were pretty much deserted with only a few of us workers left to manage things. Not much was happening and we were soon to be told to close up and head home. surrounding what I was certain could only be an Inuit visitor. Stamping his mukluks clear of snow and yanking back his parka hood, Farley Mowat grinned at me. It was surreal. He marched down the hall toward the editorial department. For a moment, I wondered what he was doing there. But soon turned to the challenge of walking out into the snow to find a bus, any bus, that might take me home. A few days later, at the annual Christmas party, I learned the reason. Farley had come in on that crazy winter day to sign some of his books. Each one personalized. Each one for every M & S employee. “To Ruth” And, in a lovely gesture, a copy was signed even for each of the seasonal workers. It was a class act and one that I have never forgotten. Thanks, Farley. For everything. National Film Board offers a glimpse of the power of Farley’s writing in the short film, 10 Million Books, An Introduction to Farley Mowat. What lovely memories of a Canadian great! So jealous and such agreat remberberance and tribute.